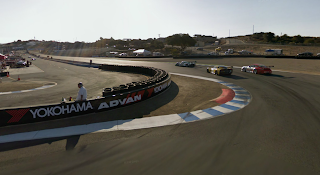 Mazda Raceway at Laguna Seca California. 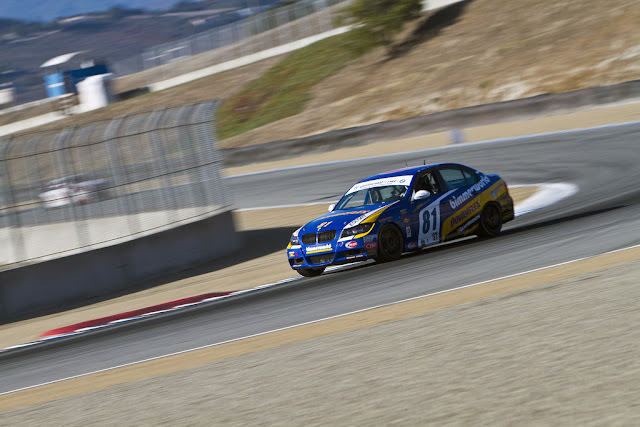 The iconic Corkscrew, how do you drive it like a boss? We asked Grand Am Continental Cup Bimmerworld driver Gregory Liefooghe for some tips. 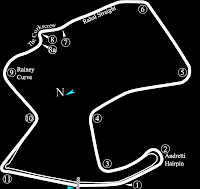 Living in San Francisco, Infineon Raceway is my home track, I’m working there every week but Laguna is very close to home. Laguna has a few quirks, some interesting and at least one, very annoying: aside from a few official race weekends, the sound limit is 92 db! Yes, you read that right, 3db less than what is street legal in California. 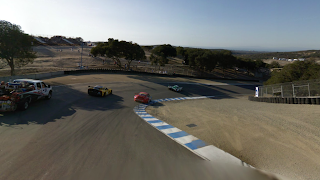 Laguna is a medium speed track. Aside from the corkscrew, there are no combination corners just good old fashion sweepers. 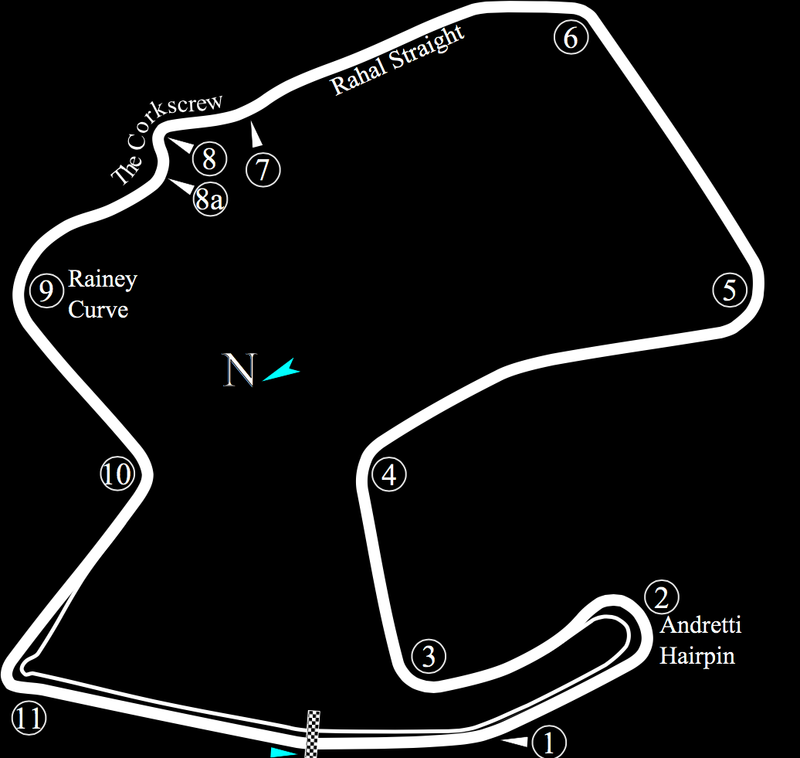 The track is safe, thanks to Moto GP coming every year, with lots of gravel traps to catch the car. It is especially hard on brakes, with no real straight to cool them down. The on-throttle time is not very long compared to a typical track and we tend to use less fuel here than anywhere else. Laguna has a very specific surface, it’s very slippery. 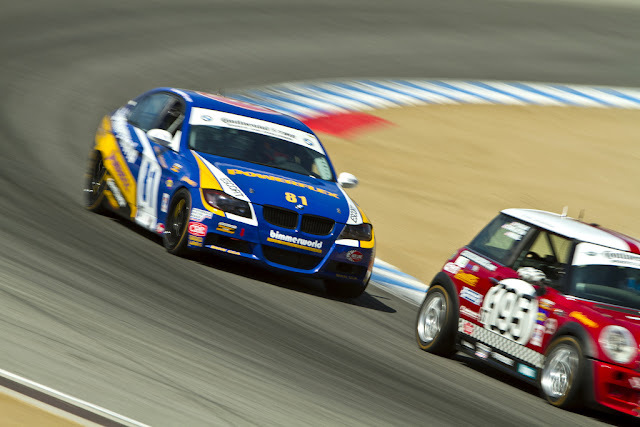 If you are coming from another track with a “normal” amount of grip, you will literally think something broke on your car. You will want to change your car set up significantly to allow the car to roll more and produce more grip. One of the key elements here is using the whole track width including the curbs. There really is only one rubber line that you have to use in order to get the maximum grip out of the track. What makes it tricky is that you have to come close to the red motorcycle curbs without hitting them because if you do, you will bend your wheels enough that they can eventually fail a few laps later. 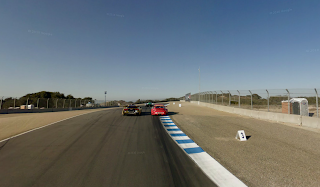 T1 is a kink on the straightaway that can be challenging when you are in a fast car. It is completely blind, and some people use some kind of electricity pole in the background to know what direction to go. Personally, I never use reference points that are way off the track, it usually makes you late on everything you do because first you have to look for it, and then you have to steer towards it. Instead, I usually take a mental picture of the angle of the car going through the blind spot and I look for that every lap. This corner will be full throttle no matter what you are driving. Turn 2 is a double apex corner. It always makes me cringe when I hear about the late turn in, late apex school line. The line will see you put your front left side tire on the inside curb on your first apex, and also on your second apex. The focus through this corner is all about using the brake release to rotate the car and being able to get back on the gas. I won’t give you a braking point, this will depend on your car, but what I will tell you is to pick a braking point that will allow you to have enough time to release the brakes and have about 10% brake pressure right after your first apex to allow the car to rotate. Coming out, patience is key, you have to roll on the throttle once and only once. Turn 3 is harder than it looks. Lap times will come from mid corner speed, but you still have to get on the throttle right after the apex. 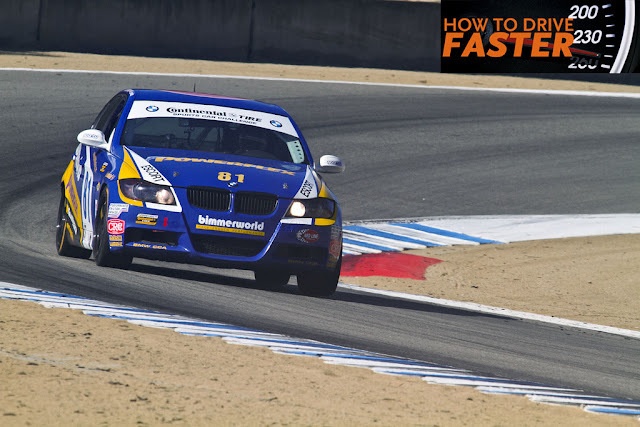 This corner will tend to make you brake too late, and if you do you will enter it with too much brake pressure, killing the rotation you need to get back on the gas. Again, aim for your inside front tire to be on the apex curb. 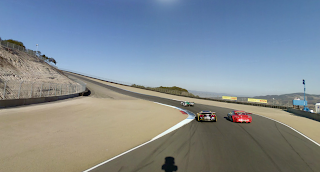 Depending on your car, turn 4 can be flat, a little lift, or a little brake. No matter what you’re driving this corner is faster than you think. You’ll have to use all of the track going in, all of the curb in the middle and all of the exit curb. If you drop a wheel, make sure to ride it out straight and come back on the track slowly, this is one place that eats up cars from drivers that come back on the track too quickly. Turn 5 is all about using the banking the track is offering you. This means the turn in point is going to feel early, but the key is to turn your steering slowly so you can still reach a late apex. You need to carry good speed into this corner, as the uphill will catch you as well. There will be a fine line between carrying enough speed to maximize the banking and the uphill, and overshooting the corner. Again aim to put your inside front tire on the curb. Starting to see a trend here? Turn 6 is a challenging corner because of a few reasons. First, it’s blind going in, second it’s fast, and last but not least, you’ll have to use all of the exit curb if you want to get a fast lap time. 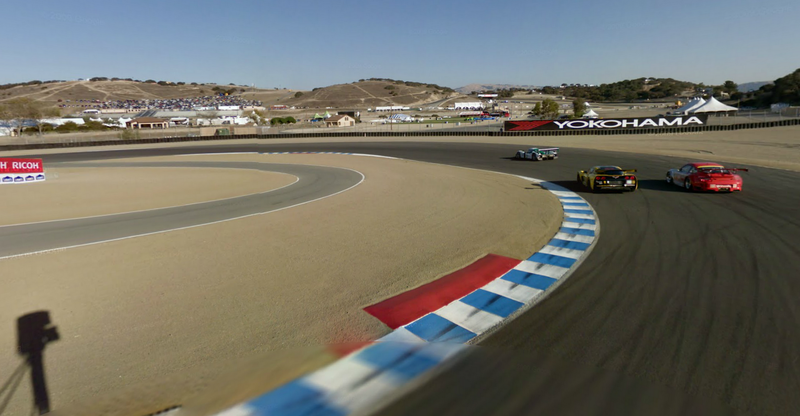 The track falls away from you right at the turn in and picks back up right at the apex. Think about the weight transfer. Your car handling will dictate where you want to get back on the gas. If your car is a little too free for comfort, you’ll have to pick up some maintenance throttle, just enough to put some weight on the back. If your car pushes you’ll have to wait longer. Be sure to pick a speed that allows you to start rolling on to full gas at the apex. Most likely, if you are carrying enough speed, your full throttle point will be right as you are reaching the exit curb. Don’t forget to use that inside curb. If you go off at the exit, Turn 6 just like Turn 4 is a place where you want to come back on the track very slowly; the wall on the inside is used, unfortunately, on a regular basis. The fame corkscrew is a very particular corner. There is nothing quite like it. On a cool down lap if you look far enough, and it’s a clear day, you’ll see the ocean, which is quite a sight from a racetrack! Other than that, the only technical part is the braking zone. The rest is slow speed and the banking is working in your favor, making it an easy corner. No matter what car you drive, you will have to start braking before the little hump. 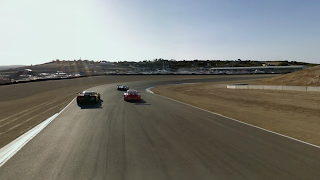 Don’t forget to set up all the way to the left side of the track as you are going up the hill out of T6, then aim for a straight line braking across the track. Braking pressure wise, you want to hit the pedal hard, release a good amount of pressure over the hump, and get back to a harder brake pressure, before doing your final brake release. Going down the hill is completely blind, and once again, some people like to look at a tree off the track, I just go with a mental picture here again. On the downhill right-hander, you’ll have to make sure not to ride too much curb, otherwise your right front will catch some air, and the landing can be rough. 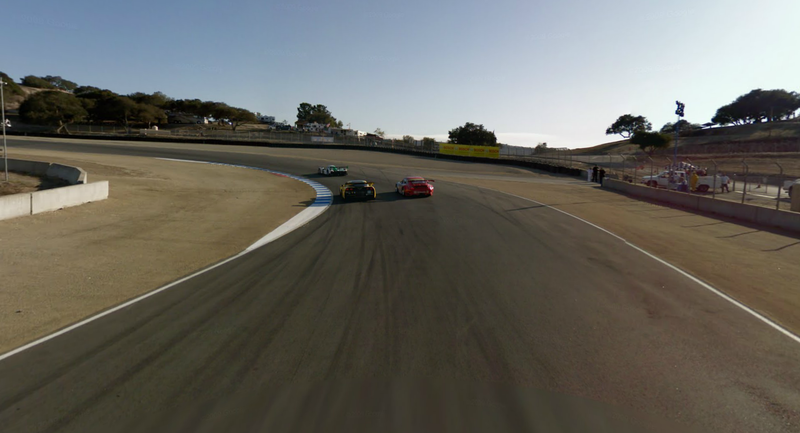 I think turn 9 is the most challenging of all at Laguna. First, the entry is not as clear-cut as just going all the way to the outside. As you are coming out of the corkscrew, you need to try to set up to the right as quickly as the car will allow you. That means, don’t create a strong left to right weight transfer on the entry just to set up all the way to the right. If you end up in the middle of the track, that’s good enough, if you end up a more to the right, that’s great, but do not force the car too wide. The entry is blind right before you turn in. As you turn in, make sure to pick up your eyes and look for the exit. Don’t focus your sight on the apex for too long. The exit is a bit tricky, and I tend to leave a foot between my car and the exit curb because the wider you go, the more the track falls away from you. You will be aiming to roll back to full throttle at the apex, and never lift before the braking of turn 10, which means some patience will be necessary. If you feel the need to pick up the gas before that, I would suggest trying to carry more speed in. 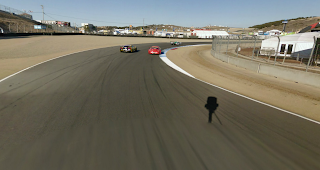 Turn 11 has a groove to it, turn in too late and you will loose all the grip the track has to offer. 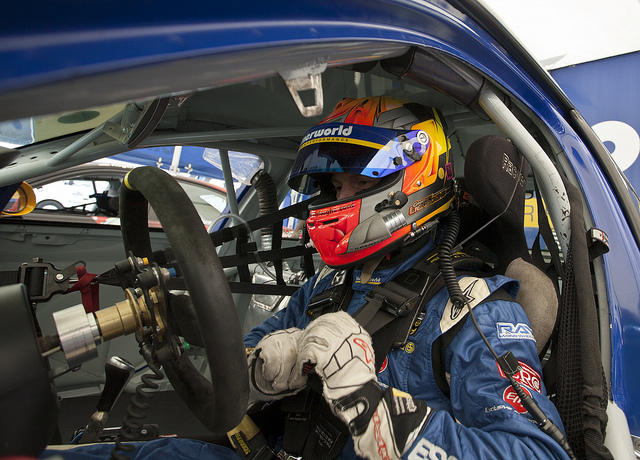 You have to turn in with slow hands and keep feeding more and more steering all the way to the apex. Braking wise this is a hard braking zone, which means you are going to look for your max brake pressure right at the beginning of the braking zone and work on your brake release to help the car rotate. If you’ve done everything right, you will be starting to unwind the steering and feed on the gas at the apex. Remember that basic rule about string linking the steering and the gas? You cannot apply the gas until your steering starts to open. 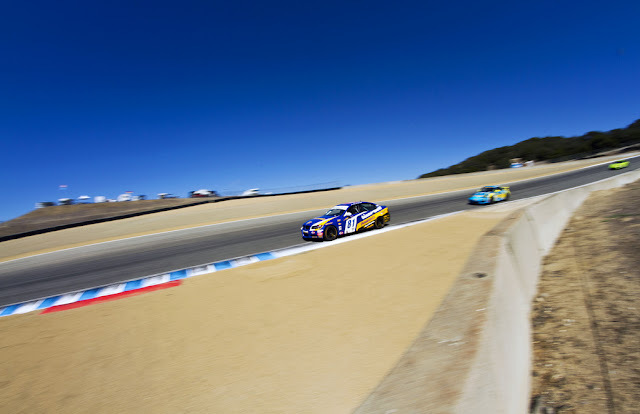 Laguna is a handling track. 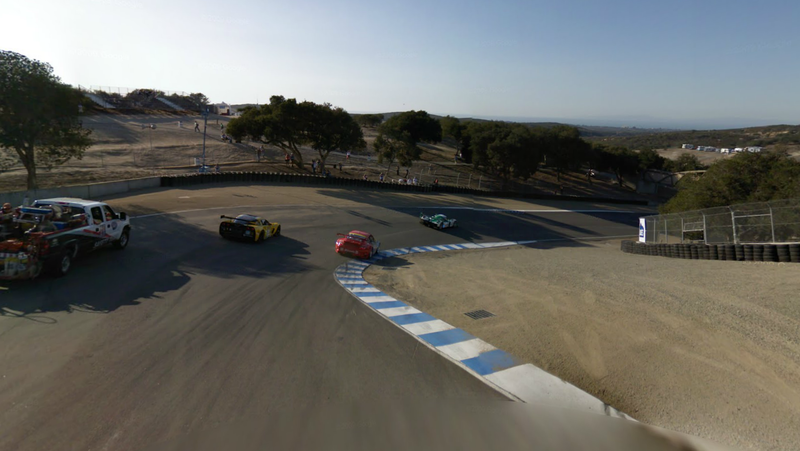 Torque will come at a premium as well because the track goes uphill from T11 to T1, from T5 to T6 and from T6 to the corkscrew. Set up wise, you will have to look for maximum grip, which means soft sway bars, probably softer springs. Usually all those changes make the transition (combination corners) handle poorly, but fortunately there are none around this track. If you are fighting a loose car, don’t hesitate to unhook your rear sway bar, and adjust the front one to get you balance back. Tire and brake wear are brutal around that track as well. 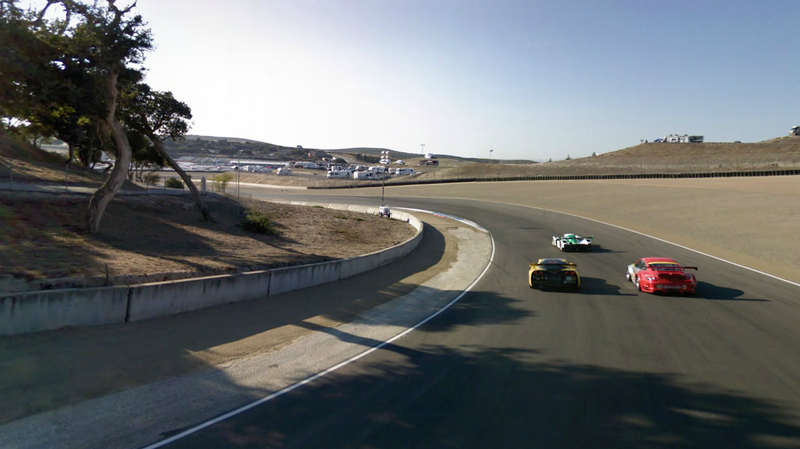 Laguna is a one-lane track. It is very difficult to pass around this track if you are racing against someone who runs a defensive line. 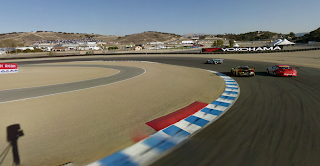 The best example would be T2, which on paper looks like a great place to pass with a hard braking zone. The problem is that a defensive line is still a fast enough and that makes it very hard to pass in that corner. The best places to pass are going into T5 and T11, for which you will have to focus on a good exit in the corner leading up to them if you want to make something happen. On all the other corners, it is possible to sneak by someone if your competitor made a mistake, but you will have to be very assertive. 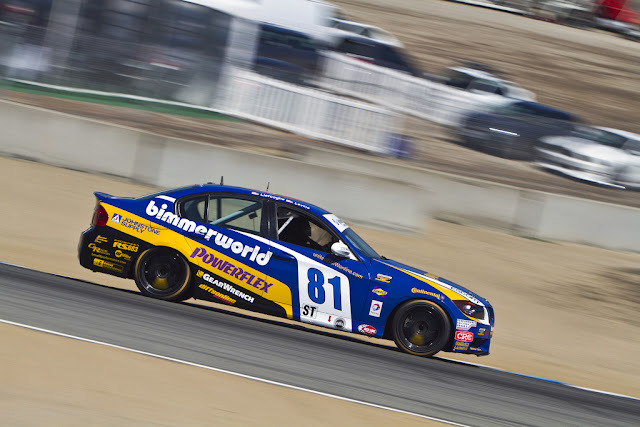 The car I’m driving in the video is our #81 BimmerWorld Grand-AM E90 BMW 328 ST car. 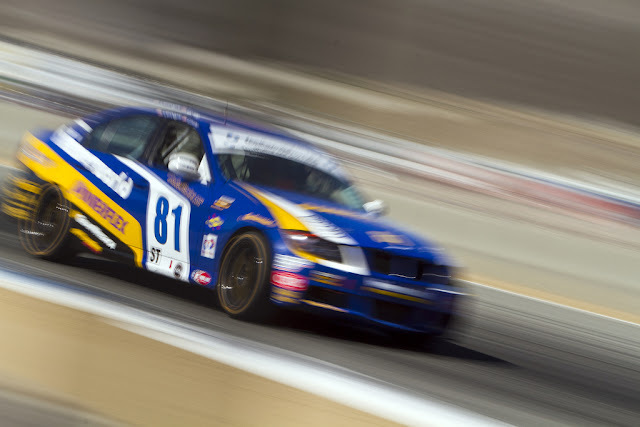 Due to the series regulations, the car is kept close to stock: mandated Grand-AM 2 way adjustable shocks, adjustable sway bars, very limited power modifications, and an enormous amount of engineering to make everything work together. Also, we have to run stock calipers and stock rotor sizes and with races lasting 2.5 hours, it puts a tremendous amount of stress on the brakes. We use Performance Friction brake pads and rotors, and we get the best braking performance and endurance out of the whole field even though we run the heaviest car. 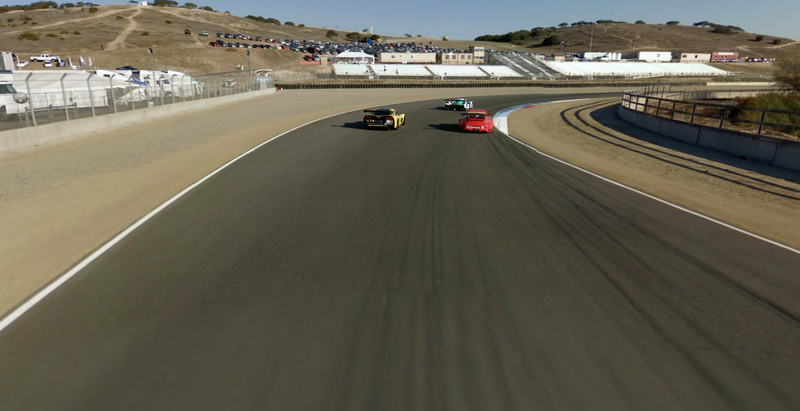 Race pace around Laguna will be around 1:41.5.
i'm impressed that stock calipers don't get destroyed but i'm assuming you've got ducting and perhaps ti shims helping manage the heat? Every racecar has ducting and most track cars should. We do need to replace the rubber guides a couple of times a season (required to run that part). Otherwise, stock calipers aren't as precise as the nice PFC stuff, but they will stop a car for hours at a time pretty effectively. 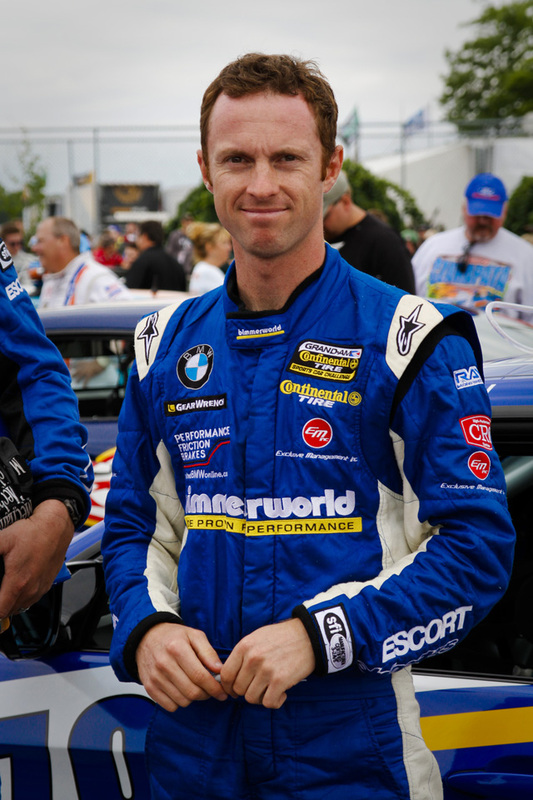 Just lowered my iracing laptimes by 1.5 using this guide! Glad to hear! Keep working on it. Awesome write up. I'm running Laguna for 8 hours in my Chumpcar prepped Honda CRX. Just fwd'd this guide to my teammates. Huge thanks mate! as an gamer.. this article was very helpful in attacking laguna! great points!! i especially took note of the "not looking far off the track for breaking points". thank! !